In A Man of His Time by Kate T. Billingsley, a descendant of Supreme Court Chief Justice Taney (who handed down the disastrous 1857 Dred Scott decision) invites a descendant of Dred Scott to meet him at a highway diner halfway between Virginia and Vermont. Scott shows up. It stars Sam Waterston (The Killing Fields, “Law and Order,” “The Newsroom,” “Grace and Frankie”) as the contemporary Taney and the acclaimed stage star John Douglas Thompson (TONY nomination for Jitney, Satchmo at the Waldorf, Othello) as the contemporary Scott. Estelle Parsons (Oscar win for Bonnie and Clyde, “Roseanne,” August, Osage County) directs. It is written by Kate T. Billingsley and recorded and co-presented at the Jerome L. Greene Performance Space at New York Public Radio. Stay tuned after the performance for a conversation moderated by our Producing Artistic Director, Claudia Catania. In IT'S ALL GOOD, a short play by a master of the form, David Ives (Venus In Fur, All in the Timing), a Chicago native visits his hometown and encounters his past. Directed by Tony Award winner John Rando, IT'S ALL GOOD features Carson Elrod, Rick Holmes and Kelly Hutchinson. As you'll hear, this is a four character play, but at the last minute, one stellar actress was struck down by extreme flu and Kelly valiantly assumed both roles! Stay tuned after the performance for a conversation moderated by our Producing Artistic Director, Claudia Catania. In Two Jewish Men In Their Seventies, by Pulitzer Prize Finalist, Alexandra Gersten-Vassilaros, two great comedians Jerry Stiller (“Seinfeld”, “The King of Queens”) and Bob Dishy (Sly Fox, Along Came Polly) play two old friends visiting a new holocaust museum. They don't like it so much. They've seen better. This funny and moving short was one of the very first short plays Playing on Air recorded. Thank you, Alex, Jerry, and Bob. Stay tuned after the performance for a conversation with with the playwright, moderated by our Host, Claudia Catania. In Closing Costs by Arlene Hutton, a real estate broker hits her threshold when a client reveals her listing is the 396th co-op he’s seen. It features Amy Ryan (Gone, Baby, Gone; Bridge of Spies, Birdman) and Michael Stuhlbarg (A Serious Man,"Boardwalk Empire"). Playwright Arlene Hutton is an alumna of New Dramatists and author of The Nibroc Trilogy and Gulf View Drive. Directed by Gaye Taylor Upchurch (Director: Bethany with America Ferrara for The Women's Project, Harper Regan for The Atlantic Theater Company and Stay for Rattlestick Theater). Stay tuned after the performance for a conversation with with the cast and playwright, moderated by our Host, Claudia Catania. Tony, Oscar and Pulitzer Prize winner John Patrick Shanley (Doubt, Moonstruck, Outside Mullingar) writes and directs this short play about a banshee, a fantastical Irish spirit. In it, she pays an ailing teacher a visit and makes him an otherworldly proposal. It features Geraldine Hughes (Jerusalem, Gran Torino, Rocky Balboa) and Aidan Quinn (“Elementary,” Michael Collins, Desperately Seeking Susan). Stay tuned after the performance for a conversation with playwright and actors, and catch some surprising answers from this Irish cast. Interview moderated by Producing Artistic Director, Claudia Catania. "As starkly moving as taps at dusk" says the Washington Post about BEYOND GLORY, a powerful tribute to military valor written and performed by stage and screen star Stephen Lang (Colonel Quaritch in Avatar). First Lieutenant Vernon Baker and Captain Daniel Inouye (who later became the long-serving US Senator from Hawaii) both experienced racism in the armed forces during WWII and recount that as well as the incidents that earned them the Medal of Honor many years later. Stay tuned after the performance for a conversation with Stephen Lang and Producing Artistic Director, Claudia Catania. In The Other Woman by David Ives, an insomniac writer experiences a different side of his wife after darkness falls. It features Laila Robins ("Homeland"; Planes, Trains & Automobiles) and Robert Cuccioli (Jekyll and Hyde, Spider-Man: Turn Off the Dark). Directed by Tony Award winner, John Rando. Stay tuned after the performance for a conversation with the playwright, David Ives, and Producing Artistic Director, Claudia Catania. In You Belong To Me by Daniel Reitz, two old friends from graduate school meet in a subway car 18 years later under vastly different circumstances. 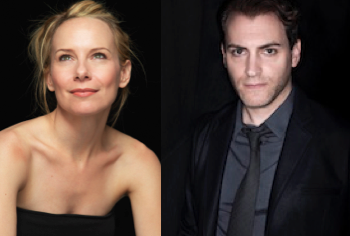 Featuring Amy Ryan (Oscar nomination for Gone, Baby, Gone; Birdman) and Michael Stuhlbarg (A Serious Man, "Boardwalk Empire"). Stay tuned after the performance for a conversation with the playwright and Producing Artistic Director, Claudia Catania. In The Miracle of Chanukah by Sheri Wilner, a holiday guest’s personal miracle throws a family for a loop. Featuring Zach Appelman, Peter Friedman, Judy Gold (Emmy Award), Marcia Jean Kurtz and Lisa Joyce. Stay tuned after the performance for a conversation with the playwright and cast.